Moving to San Luis Obispo? Meathead Movers is here to take care of the heavy lifting for you on your move to San Luis Obispo. Our clean-cut student-athlete movers are ready to get you safely settled into your new San Luis Obispo home. Welcome to Meathead Movers of San Luis Obispo! If there’s a happier whistle-while-you-walk, all-American town than San Luis Obispo, you’d be hard-pressed to find it. This Central Coast city, which locals call San Luis, or just SLO, was named “the happiest city in America” by Oprah Winfrey and by author Dan Buettner. You could also amend that by calling it “the happiest bicycling city in America” since bicycling has steadily increased as a mode of transportation in SLO. The city was designated as a Bicycle Friendly Community by the League of American Bicyclists in 2007. In fact, San Luis Obispo is also famous for hosting a monthly bike night where both locals and students dress up for a fun night of biking throughout the town. In addition to biking, there are plenty of other activities that draw so many students, visitors, and residents to SLO. It’s renowned for outdoor sports such as hiking, kayaking, surfing, windsurfing, diving, sailing, and kiteboarding. History is also an important element of San Luis Obispo’s makeup. It’s the site of one of Father Junipero Serra’s famed California missions. In fact, the town of San Luis grew up around the mission, established in 1772. After you explore the San Luis Mission, you can explore other iconic landmarks such as the Nine Sisters, a series of distinctive hills that run through the town, eccentric Madonna Inn, and Bubblegum Alley, a short alleyway in which people have stuck gum on the walls since the 1960s and has never been cleaned off. With three out of the six top employers of the region being education-related, including California Polytechnic Institute State University and nearby Cuesta community college, the city is home to more than 30,000 college students. And since Meathead Movers hires only strong, clean-cut student-athletes from Cal Poly and Cuesta College, you can be sure you’ll get the best movers the area has to offer. Our movers are professionally trained and certified, so you can be assured that your cherished household possessions are in good hands no matter if you’re leaving, arriving or just relocating to the San Luis Obispo area. Whether your move is local, long-distance, or commercial, we have a wide range of services that we can help you with. We also provide reliable packing, storage, on-site relocations, and our distinctive moving concierge service, which connects you with local service providers. With our 100% satisfaction guarantee, the only thing you have to lose is the stress that comes from moving! 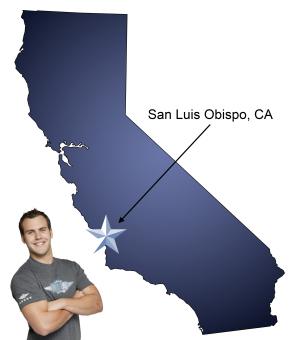 Call us today for a fast, free and competitive moving quotes on San Luis Obispo Movers. Moving to San Luis Obispo? Here are some helpful resources. Moving from San Luis Obispo? View more San Luis Obispo resources.